Delicious golden-yellow pods are stringless and are of good quality with extra-fine rich flavor. This old-time favorite has bush plants. This improved golden wax type that grows on compact, upright plants 15 to 18 inches tall. 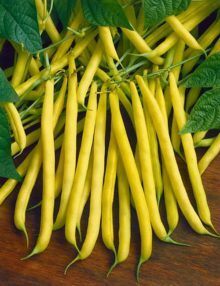 The tender, flavorful, stringless golden yellow pods are thick, meaty, slightly flat, straight and long. Seeds are white with brown markings on the eyes. An excellent, heavy yielding, very popular home garden variety that is unbeatable for canning and freezing. Disease tolerant to common mosaic virus and rust. Use fine mesh netting for support tied between two poles at the end of each row as it is easier than tying up canes. Tropical cultivation : mainly during dry season. Without support. Barrix Vegetable Fly Trap is a pheromone trap, which consists of chemically synthesized pheromones in the form of a lure to attract and trap pests of the Bactrocera cucurbit species (commonly known as Vegetable Fly), which causes major pre-­‐harvest damages in Vegetables. Violette Climbing Beans have beautiful deep purple pods which turn dark green on cooking. They have a fine flavour and harvests over a long period in either glasshouse or out in the open. Climbing beans such as this variety should be supported much in the same way runner beans are. “Whether for pickling or slicing, cucumbers are easy to grow if you give them good soil, full sun and sufficient moisture, and wait for weather to warm before planting. There is nothing like the taste of a freshly picked tomato, warm from the sunshine. it is worth growing at least one tomato plant for the pleasure it will give you. They will grow in pots, troughs or even hanging baskets. Adequate support has to be given to the plant or the branches would break under the weight of the fruits. The plant grows up to a height of 20 to 90 inches in length. With every order you will receive guidelines for sowing, replanting and care for your tomato seeds. Ease-of-care: moderately difficult – Requires deep, well-prepared soil, early planting, and good early weed control.